Looking for magnificent views out on your patio? Want to see the fireworks over the river on all the holidays from your own back yard. Check out this gorgeous home located in the super desirable, no HOA community of Sunridge Estates. Over 2100 feet of a super luxurious, well kept home. The entry welcomes you into the beautiful great room that is perfect for entertaining. Have your friends sit up at the huge kitchen island while you prepare food or cocktails for the party. Guests can roam out to the large covered patio in the back and take in the lights from the casinos over a glass of wine. Huddle around a bonfire in the winter evenings or take in a sunset in the summer. Two spare bedrooms provide enough room for family and friends to stay the night. You don't have to give up your den or office space to accommodate for the 2 spare bedrooms...This home has the space that can provide for this use or convert to a 4th bedroom. Close to lake and river access, plus easy to escape on your ATV out to the desert. 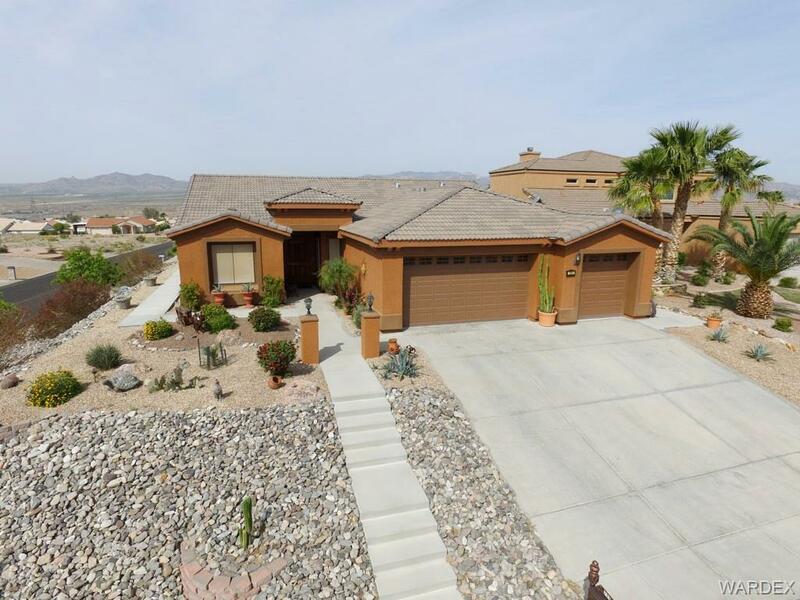 Take a look at this amazing home where the cool water of the Colorado River meets the hot sands of the Mohave Desert!